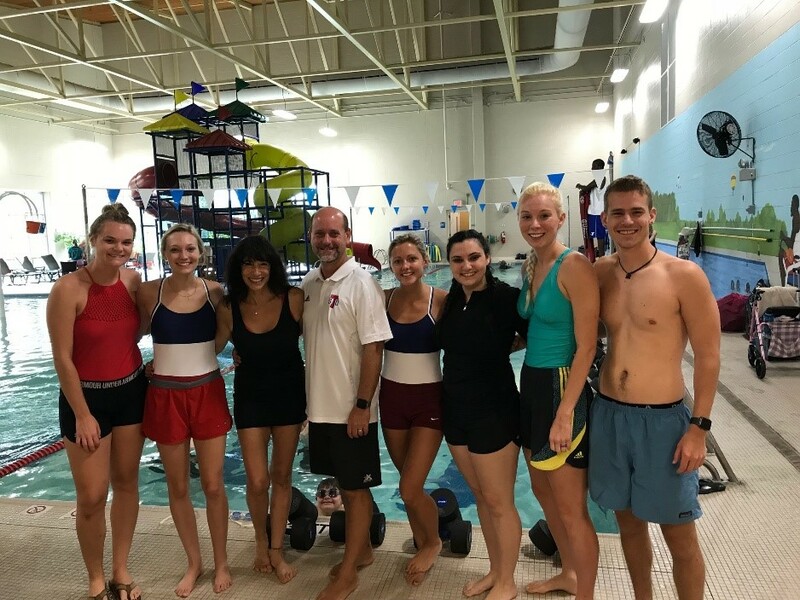 Belmont University students from the Schools of Physical Therapy (PT) and Occupational Therapy (OT) performed aquatic exercises with the Nashville Dolphins under the direction of Dr. Natalie Michaels, professor of both PT and OT at Belmont, and Dr. Timothy Jones, associate professor and aquaticS specialist in the Department of Human Performance and Sports Science at Tennessee State University. The Nashville Dolphins, under the direction of Megan Kelly, is a group of children, teens and young adults, many with Down Syndrome, who enjoy swimming. Students from the DPT program included Hunter Pickens, Mallorie Sweat, Emily Averitt and Courtney Alama. Students from the OTD program included Emma Mace and Sally Widmann. Hunter Pickens and Mallorie Sweat also served as song leaders. Approximately 12 members of the Dolphins participated. They reported that they “had a blast,” and really seemed to enjoy their interactions with the Belmont students.